Find another answer, Mr. Governor! Okay, New Jersey… what part of “keep the records open for research” do your officials not understand? It’s one The Legal Genealogist would like everyone in our community to pose to the Governor, Lieutenant Governor, State Treasurer and members of the New Jersey State Legislature. Because if we don’t ask the question, and insist on an answer that makes sense, the next five years are going to be a total nightmare for researchers, genealogists and historians in the Garden State. Because the Governor’s Office has decided that totally disrupting the functions and services of the New Jersey State Archives is the way to handle the problems caused by the need to renovate the New Jersey State House and the temporary relocation of the Governor’s Office during those renovations. 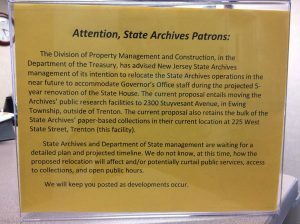 The plan as it stands at the moment will relocate the State Archives out of its current facility at 225 West State Street in Trenton for the duration of the five-year renovations at the state capitol building, the State House. Not all of the State Archives, mind you. Some of the records and archives themselves — in fact, the bulk of the paper-based collections of the Archives — will remain in Trenton. But the staff and the research room would be moved some 3.3 miles away to 2300 Stuyvesant Avenue in Ewing Township. If the documents are in Trenton, but the reading room and staff are 3.3 miles away in Ewing, just how easy do you think it’s going to be to access anything? How easy will it be for the staff to continue their daily work on records access, records presentation, digitization and more? How easy will it be for anyone to get a vital record or a court file or a land file from the Proprietors of East or West Jersey or any of the other myriad records held by the State Archives? You can see the problem. I can see the problem. Apparently, the Governor’s Office — which has, in the past, lauded the State Archives as a Garden State gem — can’t see the problem. Or, more likely, doesn’t want to see the problem since, after all, it fixes the Governor’s problem of what to do with his staff. Mr. Governor, this attack on public records access is not the way to fix your problem. With all the many government agencies located in Trenton in buildings near to and far from the State House, choosing the State Archives as the one to disrupt like this is a thoroughly lousy choice. Which brings me back to that question: what part of “keep the records open for research” do your officials not understand? And how do we, as genealogists, researchers and historians, bring this to their attention? The Genealogical Society of New Jersey has links on its website to contact the Governor’s office and — if you live, work or research in New Jersey — the state representatives whose districts you impact, along with a proposed letter you can use and modify to focus on your own concerns. There are other buildings, other agencies, other facilities that could be selected for this five-year period where the disruption won’t mean a major hit to public records access. Closing records to public access is not the way to make friends and influence people — it’s a bad choice for New Jersey residents and everyone who uses New Jersey records. Find another answer, Mr. Governor. Leave the State Archives alone. I would like to suggest that your readers take a few minutes to adapt the proposed letter suggested by the genealogy society to make it their own. Politicians tend to give more weight to letters from individuals who care enough about an issue to have written their own personal thoughts and they discount form letters that show signs of having been copied and sent as part of a mass campaign. They especially tend to ignore email messages that appear to have been cut and pasted from an advocacy group’s website. Instead of simply copying the proposed letter, choose from the points mentioned in it a few that mean the most to you personally and add a few sentences explaining why you feel that way. If you make it a personal message from you to the governor, your letter is likely to make a much bigger impression on him than the most eloquent form letter. Egad! One of my round tuits is to go up there and search land records from the 1840s. Better write and get up there sooner than later! Ward, Samuel (ux) (Grantor)	TO: Joseph Hedden, Jr.
CONVEYANCE. Great Meadows, Newark, Essex County.